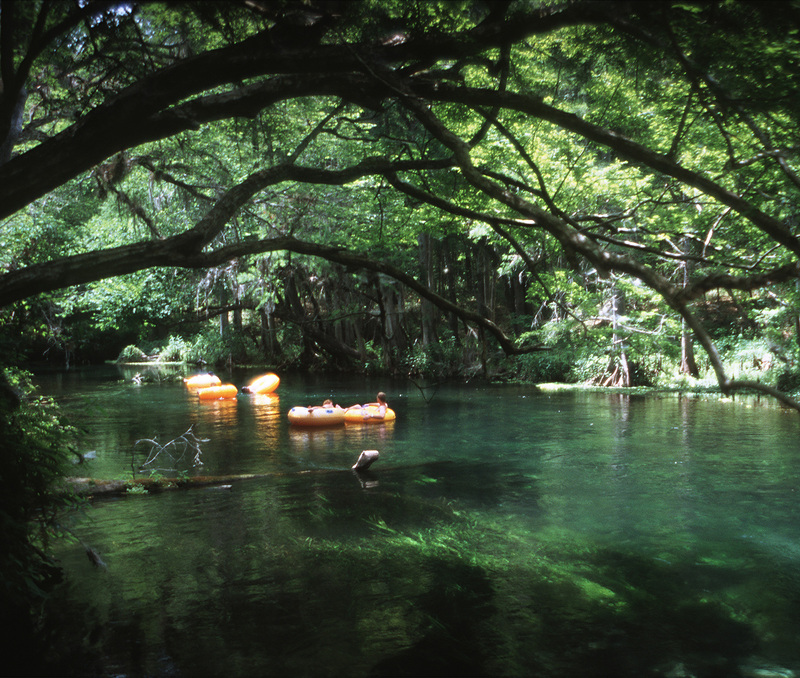 Florida is endowed with magnificent water resources, ranging from crystalline artesian springs to an abundance of rivers, lakes, wetlands and marshes. The underground Floridan Aquifer is the most bountiful fresh water-bearing formation in the Southeast U.S. The incomparable Everglades supports a world-renowned ecosystem while also supplying fresh water for South Florida. Before settlement, half of Florida’s landscape was covered in wetlands. Settlers directed great effort and energy to ditching, draining and diverting water. Today’s water picture is quite different. Even though the Sunshine State receives an average of 55 inches of rainfall a year, some locations in Florida are experiencing water shortages as withdrawals from surface and underground sources exceed recharge. In addition, water quality problems exist in Florida, with many of the state’s natural water bodies determined to be “impaired”. Figure 1. Ichetucknee River-Florida’s springs provide fresh water for people and wildlife as well as recreation. Credit: UF/IFAS photo (00091S) by Audrey Wynne. To address these problems, conserving water and preventing water pollution now are much more cost effective strategies than developing new water supplies, expanding use of alternative sources and/or treating polluted water. The following recommendations identify easy ways that Floridians can conserve water and prevent water pollution. Following these suggestions will save you money, conserve water resources, protect water quality, and contribute to the present and future water security of your community. Conservation is more cost effective, energy efficient and environmentally friendly than development of new water resources. Unlike supply-side solutions, conservation keeps more water available for future use and helps maintain flow levels in rivers, lakes, springs and aquifers, protecting fish and wildlife dependent on those flows. Far and away, the largest water savings from public water supply can come from reducing the use of water outdoors to maintain lawns and landscapes. It is important, however, to conserve and use water efficiently indoors as well. Here are ten ways to save water in your homes, lawns and landscapes. 1. Start keeping track of your water use. Do you know the size of your water footprint? Consciously tracking your water consumption is the first step to reducing it. If you are on a public water supply, tracking your use is easy: just look at your water bill. Most water utilities in Florida measure and bill water use in 1,000 gallon, or kilogallon (kgal), increments. As you begin to track your monthly use, you will begin to discern patterns. Does your use spike in April, May and September? This is when outdoor water use peaks for most Floridians. To look at your water use in another way, you can estimate your daily personal consumption – gallons per person per day, or per-capita use—by dividing your monthly household use in gallons by the number of days in the billing period and the number of people in your household (although there may be variations in individual use among different household members!) If you are really curious about measuring your daily water use patterns precisely, you can also take note of the reading on your water meter at the start and end of a typical day and then calculate the difference. Be sure to consider both weekdays and weekends. If you get your water from a private well, you can install a meter to monitor your use. Or, you can estimate your use with an online home water use survey, such as the one at this website. This survey is a fun, interactive way to learn how your household practices contribute to your overall water use. By keeping track of your water use, you can then develop a personal water conservation plan, put it into action, and measure your progress. 2. Follow Florida-friendly Landscaping techniques. In Florida, irrigation of lawns and landscapes represents the single largest use of water from municipal water supplies. A study reported in the Journal of Irrigation and Drainage Engineering showed that Central Florida homes, with an average cover of 79 percent turfgrass in their landscaped area, used almost three-quarters of their municipally supplied fresh water for irrigation purposes. Follow the recommended schedule for watering shrubs and trees through establishment and remember that once they are established, watering can be discontinued for most trees and shrubs. For details, consult Establishing Shrubs in Florida Landscapes. If lawn areas in your landscape are a personal priority, choose grass that is hardy and requires minimal or no irrigation. Also, when mowing, “cut it high and let it dry”—cut grass at the highest setting on your mower and allow the cuttings to stay where they fall. This will encourage deeper root growth and reduce the water and fertilizer needs of the grass. Ask your local Extension agent for information about what’s most appropriate in your county and most suitable for your particular site conditions. Do you have further questions? See Landscape Elements for a Florida-Friendly Yard and Homeowner Best Management Practices for the Home Lawn for tips on making your yard more water wise and ecologically friendly. Or contact your county Extension office for a wealth of resources on home lawns, landscapes and gardens. 3. If you use an irrigation system, maintain it regularly. For an automatic sprinkler system, make sure the rain shut-off device (required by Florida law) is in working order and is not blocked by roof overhangs, shrubs or trees. Also, set your automatic irrigation system to apply no more than one-half to three-quarters of an inch of water each time you irrigate. Most importantly, irrigate only when needed. Instead of watering on a schedule, set the system to manual operation and turn it on only when half of your lawn area shows signs of wilting—leaf blades folded in half, blue-gray color and footprints that remain on the lawn. If you have an old in-ground sprinkler system, consider retrofitting to a new system. Consider replacing older sprinkler heads with more efficient models such as rotary nozzles or replacing sprinkler head zones with microirrigation in landscaped beds. These actions can greatly reduce your outdoor water use since newer systems are far more efficient. Stay aware of and abide by regional and local water restrictions, which may allow irrigation only on certain days of the week and hours of the day. For more information on properly maintaining irrigation systems, see the publication In-ground Irrigation Systems: Design, Use and Maintenance from the St. Johns River Water Management District. Figure 2. 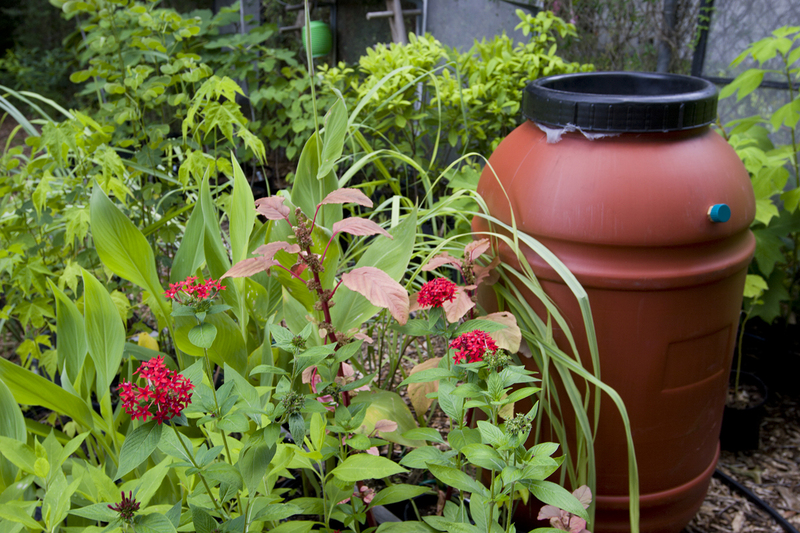 Rain barrels can supply a large portion of watering needs for many homeowners. Credit: UF/IFAS photo (06200S) by Tyler Jones. Rainwater harvesting is an age-old technique that is being rediscovered as a useful water conservation tool. You can harvest rainwater from your rooftop in several ways, from installing a large cistern above or underground to placing rain barrels at the end of your gutters or downspouts. Collecting rainwater for watering plants spares potable water for other important uses and reduces stormwater runoff from your yard. 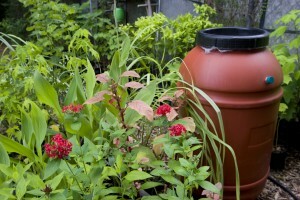 See the Florida Yards and Neighborhoods document How to Build a Rain Barrel for more information. 5. Check and maintain your toilet. For a typical household, toilets are the largest water user indoors. Toilets made before 1994 use anywhere from 3.6 gallons per flush (gpf) to 8 gpf, while low-flow toilets are currently mandated by federal law to use 1.6 gpf or less. A family of four who replaces their 1980s-era toilet (using 3.6 gpf) with a 1.6 gpf model can save 14,000 gallons of water per year. Even better are high efficiency toilets (HETs), which use 20 percent less water than the federal standard. HETs come in single flush or dual flush models, both of which are rated at 1.28 gpf or less. Single flush toilets have one flush button/lever while dual flush toilets often have two buttons/levers: one for liquid waste and one for solids. If your home was built before 1994 and the toilet has never been replaced, then it is very likely that you do not have a 1.6 gpf toilet. Check to see if your water utility offers any rebates for replacing old, inefficient toilets with new ones. See EPA’s WaterSense Partnership Program rebate finder for more information. Look for the EPA’s “WaterSense” label to find toilets and other plumbing fixtures that use even less water than the federal standard. If you want to learn more about performance standards for new toilets, visit this website. Regularly check for and repair toilet leaks. Avoid using caustic toilet bowl cleaners such as toilet tank tablets—these products can alter the pH of water in your toilet tank and damage plastic and rubber toilet parts, causing severe leaks. Don’t use your toilet as a trash can—dispose of only human waste in the toilet. Check both indoor and outdoor systems for leaks. Many undetected leaks allow water (and your money) to go down the drain. Studies have shown that more than 10 percent of the water a home uses can be wasted due to leaks, which costs both homeowners and the environment. Even “minor” leaks are important to catch: a leak as small as 10 drops per minute equates to 43 gallons of water wasted in a month. Figure 3. 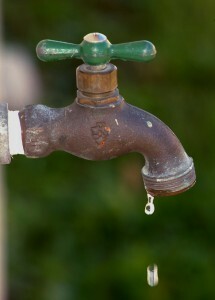 Avoid wasting water by repairing leaky faucets. Credit: UF/IFAS photo (00134S) by Thomas Wright. Reading the meter yourself is one way to check for leaks. Be sure to wait for any tank-style water heater to refill, turn off the ice-cube maker, and wait for regeneration of any water softeners to occur before taking the initial water meter reading and checking for leaks. Turn off all the taps in your house and then look at your meter. If the meter is still turning, chances are you have a leak somewhere and you will need to investigate further to find the source. For help on reading your water meter, visit How to Read Your Water Meter or contact your local utility. Important note: Some water utilities encourage customers to read their own meter while others prohibit customers from opening the meter box and tampering with the meter in any way. It is a good idea to check with your utility before examining your water meter. Indoors: Recent research on residential indoor water use identified leakage as the cause of a large amount of water loss. Faulty toilet flush valves were the leading causes of leaks—a leaky toilet can waste up to 200 gallons of water per day. Rubber, poly pipe, and often times copper hoses have a finite life and will spring leaks over time. Replace hoses from service lines to appliances and fixtures with hoses that are armored, Pex (cross-linked polyethylene) or metal (but not copper). Read your service manual for specifics on maintaining your appliances and fixtures. Outdoors: Inspect your sprinklers and drip sprayers for leaks. Puddles and broken sprinkler heads are clues to leaks. If you have an older irrigation system, chances are that you are experiencing leakage, perhaps severe. 7. Save water while laundering. Your washing machine is typically the second largest water user in your home. You can save both water and energy when you make your next washer purchase by selecting an ENERGY STAR® rated washer. These washers use about 25 percent less energy and 40 percent less water compared with non-ENERGY STAR machines. Search for an ENERGY STAR certified clothes washer at Clothes Washers for Consumers. If you have a newer model washing machine or cannot replace your older model, you can still save water by following the tips below. Check hoses regularly for cracks that could result in leaks, and consider replacing rubber hoses with metal ones. Pre-treat stains to avoid rewashing. Operate the washer with full loads only—even if the machine has an adjustable load setting. If your washer has a variable water volume setting, select the minimum amount of water required per load. Use the shortest wash cycle for lightly soiled loads. 8. Install faucet aerators and low-flow showerheads. After checking for and repairing leaks, the most effective and inexpensive way to reduce your faucets’ water use is by installing faucet aerators. Aerators are circular screened disks that screw on to the faucet. The flow number is stamped on the rim of the aerator. For bathroom faucets, low-flow aerators typically allow flows of 1.0 gallon per minute (gpm). For kitchen sinks, they can reduce flow to 1.5 gpm, compared to the Florida Building Code maximum flow rate of 2.2 gpm for new kitchen faucets. Some faucet aerators can restrict flow to less than 1.0 gpm. There are tradeoffs with this approach, however—even restricting faucet flows below code (2.2 gpm) can cause an increase in the “wait” time for hot water to travel from the water heater to the fixture. Take shorter showers. A typical shower lasts about 8 minutes and uses 17 gallons, whereas an efficient shower lasts 3 or 4 minutes and uses 7.5 gallons. A recent study showed that water use in showers has increased from 30 to 34 gallons per household per day. Buy a shower timer if you have trouble keeping showers short and need a cue to conserve—some function like an old-fashioned hourglass timer that provides a visual cue and some like an alarm clock that “rings” when your time is up. Look for the WaterSense® label on new faucets and showerheads to guarantee efficiency and performance. Each year, washing dishes using an ENERGY STAR certified dishwasher, rather than washing them by hand, can cut your utility bill by about $40 and save you 230 hours of personal time to use for other activities. If you wash dishes by hand, don’t keep the water running while you’re working, and don’t fill the sink with more water than necessary to do the job. Many newer dishwashers require little or no advance rinsing of dishes. Read the instruction manual for your machine to determine other ways to minimize water use for the rinse cycles. Check dishwasher hoses regularly for cracks that could result in leaks. Finally, limit use of your in-sink waste disposal, and if you do use it, try not to run a lot of water in the process, as many homeowners waste water when operating the device. Composting is a good alternative for disposal of many food scraps. When purchasing a new dishwasher, search for one that is ENERGY STAR certified at Dishwashers for Consumers. To cut down on your water use when traveling, choose a green hotel or green lodging option that allows you to reuse sheets and towels when you stay longer than one night. Most “green” lodging facilities also have low-flow showerheads and faucet aerators to conserve water. The Florida Department of Environmental Protection designates hotels in Florida that meet their Green Lodging criteria. Floridians can play a big part in improving water quality. The actions you take in your home, yards and landscapes can help keep pollutants out of water (the “universal solvent”) and slow the flow of stormwater across and away from your property. Some pollutants are impossible to clean out of waters that may eventually reach our drinking water sources, and cleanup of others is costly, so prevention is the best strategy. Here are ten steps to being a water-wise Floridian that are focused specifically on protecting water quality. Do your part to prevent the introduction of nutrients that can damage Florida’s water bodies by exercising great caution when fertilizing lawns, landscapes and gardens. Over-fertilizing or improperly applying fertilizer can cause excess nutrients to wash off or leach through the soil. It can also aggravate pest problems, stimulate excessive plant growth (meaning you’ll have to spend more time and fuel mowing), and increase irrigation needs. You can minimize the need for lawn fertilizer by allowing clippings to stay in place using the “cut it high and let it dry” mowing technique. If you decide to use commercial fertilizer, be sure to fertilize only as needed for specific grasses or plants, and never apply fertilizer during the dormant season or when rain is in the forecast. Choose a “slow-release” or water-insoluble nitrogen product and always sweep granular fertilizer spilled on the driveway or sidewalk back onto the grass. Changing your landscape plant palette to include more trees and shrubs can help you reduce your fertilizer use. For more information about using fertilizer appropriately, consult the Florida Yards and Neighborhoods Handbook. From a sustainability standpoint, compost is a superior form of fertilizer for gardens, trees, and ornamental plants. Not only does compost release nutrients slowly and add organic matter to keep soil healthy, but it is also created out of “waste” from your yard and kitchen, so it reduces the amount of solid waste going to landfills and the amount of water used to operate in-sink waste disposals. To add natural organics and improve soil quality in landscape beds, consider using materials readily available from your yard in your compost, like tree leaves and pine needles, mulch from pruned plants, or grass clippings. To learn more about making and using compost, contact your county Extension agent or see the composting guide on the IFAS Living Green website. 2. Capture stormwater before it runs off your landscape. Take steps to reduce stormwater flows and to prevent runoff from washing onto driveways and into streets. Make sure any gutter downspouts drain onto pervious areas in your yard (where the water can soak into the ground) instead of onto your driveway. As mentioned in the tips for water quantity, you can use a rainwater harvesting system—rain barrel or cistern—to reduce the amount of stormwater runoff flowing off of your property. Another idea to reduce stormwater runoff is to install a rain garden in your yard. A rain garden is a landscape feature that is specially designed to store and infiltrate rainwater after a storm. Once established, rain gardens can be maintained with little effort and can add beauty and variety to your landscape. A well-designed rain garden can capture virtually all the stormwater runoff from a property during typical storm events. A rain garden can be easily installed where a natural depression exists in your landscape by digging out a shallow area and filling it with gravel, topsoil, plants and mulch. Use plants that can tolerate both drought and wet conditions and that have a good root system to help take up water. Rain gardens can also be used with swales and berms to convey, capture and infiltrate water (check with your city and county code enforcement departments to make sure your design is in compliance). Your rain garden can be designed to collect runoff from your roof and water from the lawn or driveway. The size, shape and location depend on the amount of rainwater captured by your roof, driveway, and other impervious surfaces, as well as on the slope of your yard. To get help on rain gardens in your area and what to plant in them, contact your county Extension office. For sizing and other design details, see the Florida Department of Environmental Protection rain garden site or the Hillsborough County Extension publication Rain Gardens, A Manual for Central Florida Residents. 3. Don’t sweep, blow, or use water to wash grass clippings or debris into roads, storm drains, or swales. Only water should flow into a storm drain. Roads, swales, and other water conveyance features need to be clear of debris for proper water drainage to occur. 4. Protect shorelines with vegetative buffers. If your yard borders a lake, stream, river, canal or stormwater pond, keep a buffer of low-maintenance plants at the water’s edge to which you do not apply fertilizers or pesticides and that you do not mow. This area can prevent clippings, sediment and lawn chemicals from reaching the water body. 5. Limit use of hazardous substances, including toxic pesticides and household cleaners. Reduce your dependence on potentially hazardous household products by choosing environmentally friendly and least-toxic alternatives. Always read and follow the use and disposal instructions for all chemical products. Buy only what you need, and use what you buy. If you have leftovers that you will not use, give them to someone who can use them, or take them to your community’s hazardous waste collection site. You can search for hazardous waste collection sites near you at Earth911’s search page. In the garden, consider using alternative pest management solutions and never use chemicals like bleach, gasoline, or kerosene for weed or insect control. Educate yourself. Find out what ingredients are in many everyday products found under your sink, in your garage, in your laundry room or even in your bathroom. Learn about the potential health effects as well as the safety and handling of each by using the U.S. Department of Health & Human Services’ Household Products Database. For tips on making your own more environmentally-friendly cleaners for use around your home, see the IFAS publication Homemade Household Cleaners. 6. Don’t flush leftover medicines down the toilet. Pharmaceuticals and other personal care products can cause harm to the environment as well as disrupt reproductive processes in aquatic organisms. Traces of pharmaceuticals from ibuprofen to antibiotics to hormones have been found in streams, rivers and lakes. See EPA’s web page on Pharmaceuticals and Personal Care Products, and the two-part University of Florida publication Contaminants in the Urban Environment: Pharmaceuticals and Personal Care Products (PPCPs)—Part 1 and Part 2 for more information on pollution from what are generally referred to as Pharmaceuticals and Personal Care Products (PPCPs). While some PPCPs may be introduced to wastewater inadvertently—after passing through our bodies, for instance—they should never be deliberately introduced. Many chemicals cannot be removed during normal wastewater treatment processes and, after discharge to surface and groundwater, can ultimately show up in drinking water. Remember that water is called the “universal solvent” for a reason, and keep it clean. Contact your local pharmacy or your county’s waste management and/or hazardous waste management department for recommendations on proper disposal of these products in your area. See How to Dispose of Unwanted Medications for more information specifically addressing disposal of unwanted medications or visit the Florida Department of Environmental Protection’s website Unwanted Medicine Disposal Locations and conduct a search for unwanted medicine disposal locations in your county. 7. Dispose of pet waste responsibly. The EPA reports that two to three days’ worth of pet waste from 100 dogs in a 20-square mile watershed can contribute enough bacteria to temporarily close a bay to swimming and shell fishing. Pet waste that is not picked up also introduces additional nutrients (nitrogen and phosphorus) to stormwater runoff, contributing to water quality problems downstream. Always remember to scoop your pet’s waste, bag it and dispose of it in the trash. Many local rules allow for and recommend disposal of pet waste with your household trash. Call your waste management department for specific recommendations on proper pet waste disposal in your area. 8. Shun antibacterial soaps and products. Studies indicate that households that use “antibacterial” products are no healthier than those that use soap and water and other basic cleansing products. The American Medical Association recommends against using antibacterial products in the home as they may promote bacterial resistance to antibiotics, making it harder to kill germs in the future. These products also contain triclosan and triclocarban, ingredients that can disrupt hormones and do not break down in wastewater. If you need to use an antimicrobial skin disinfectant, use an alcohol hand rub or rinse product that does not list triclosan or “fragrance” in the ingredients. 9. Wash your vehicle at a commercial car wash. Many commercial car washes recycle their water, so this is a more water-wise option than washing your car at home. If you must wash your vehicle at home, wash it in your yard rather than over the driveway or any other impervious area. This will reduce the amount of soap and chemicals that run off into the storm drain. 10. If you have a septic tank, maintain it. Septic systems are widely used throughout Florida and are a potential source of water pollutants such as nitrogen, phosphorous, bacteria and organic chemicals. Prevent leaching from your septic tank by pumping it out regularly (every three years) instead of waiting until the system stops working and your toilets are backed up. Avoid overwhelming the system by using water efficiently and spacing out laundry loads. Protect the drain field by avoiding driving or parking over it and by planting only grass or other shallow-rooted plants over the tank and drain field. Finally, consider replacing an old system with a new advanced-treatment, nitrogen-reducing unit. Florida Water StarSM is a statewide water-efficiency certification program developed by the St. Johns River Water Management District. To learn more about this certification program for homes and businesses, visit the Water StarSM home page. This Florida DEP website has information and videos about Florida’s water quality and quantity: http://www.protectingourwater.org/florida_water_story/channel/. To find out more about assessing Florida’s watersheds, visit the Florida Department of Environmental Protection’s web page. To learn more about emerging contaminants in the environment, visit the U.S. Geological Survey’s website. To find out more about septic systems, see the Florida Department of Health, Division of Environmental Health, Bureau of Onsite Sewage website. For an overview of different types of septic systems, how they function, and contaminants in septic wastewater, see the EDIS fact sheet Onsite Sewage Treatment and Disposal Systems: An Overview and the fact sheet from the Florida Department of Health, Bureau of Environmental Health, Protecting Your Home, Caring for Your Septic System. Visit the Extension Service site Water for information about water conservation, water quality and more. First published June 2011. Updated and released June 2015. Haley, M.B., Dukes, M.D., and Miller, G.L. (2007). Residential irrigation water use in Central Florida. Journal of Irrigation and Drainage Engineering, 133(5), 427–434. Southwest Florida Water Management District. (n.d.). Easy Tips to Tune Up Your Irrigation System and Rain Shutoff Device. Retrieved May 15, 2015. Trenholm, L.E., and Unruh, J.B. (2012). Let Your Lawn Tell You When to Water. (EDIS Fact Sheet ENH 63). Gainesville, FL: University of Florida, Cooperative Extension Service, Institute of Food and Agricultural Sciences. Retrieved January 19, 2015. California Urban Water Conservation Council. (n.d.) Toilet Water Savings. Retrieved May 17, 2015. All the flap on THE FLAPPER. (n.d.). Retrieved May 17, 2015. Vickers, A. (2001). Handbook of Water Use and Conservation. Amherst, MA: Water Flow Press. International Code Council. (2014). Florida Building Code 2014: Plumbing (5th Edition), Table 604.4, Maximum Flow Rates and Consumption for Plumbing Fixtures and Fixture Fittings. DeOreo, William B. (2011). Analysis of Water Use in New Single Family Homes. Report submitted to the Salt Lake City Corporation and the U.S. E.P.A. Aquacraft. United States Environmental Protection Agency-ENERGY STAR. (n.d.) Dishwashers for Consumers. Retrieved May 17, 2015. Mclean, Drew C., Koeser, Andrew K., Shober, Amy L., Qin, Zhixuan, Hasing, Gitta, and Beeson, Richard C. (2014). Incorporating woody ornamentals into residential landscapes to reduce nutrient leaching. (EDIS Fact Sheet ENH 1242.) Gainesville, FL: University of Florida, Cooperative Extension Service, Institute of Food and Agricultural Sciences. Retrieved May 17, 2015. United States Environmental Protection Agency (US EPA). (n.d.). Aquatic life: Contaminants of Emerging Concern. Retrieved May 17, 2015. United States Environmental Protection Agency (US EPA). (1993). Guidance Specifying Management Measures for Sources of Nonpoint Pollution in Coastal Waters. Washington, DC: US EPA, Office of Water. Retrieved January 21, 2015. Aiello, A.E., Larson, E., and Levy, S.B. (2007). Consumer antibacterial soaps: effective or just risky? Chemical Infectious Diseases, 45 (Suppl. 2), S137–S147. Environmental Working Group. (2007). Down the Drain: Water pollution caused by cosmetic chemicals, cleaning supplies and plastics. Retrieved May 17, 2015. Toor, Gurpal S., Lusk, Mary, and Obreza, Tom. (2014). Onsite Sewage Treatment and Disposal Systems: An Overview. (EDIS Fact Sheet SL 347). Gainesville, FL: University of Florida, Cooperative Extension Service, Institute of Food and Agricultural Sciences. Retrieved February 24, 2015.